Any email that contains wording on using our product in any form that is not legal. IT WILL NOT BE ANSWERED. Any email asking questions covered on the site. IT WILL NOT BE ANSWERED. Emails that make no sense! "I want a fake sick note, how I buy?". IT WILL NOT BE ANSWERED. If you still have questions - drop us an email - drsnotestore@gmail.com - we endeavour to reply within one business day. Phone or text us on +447939242680 - but email is always the best way to contact us - and we always reply promptly. 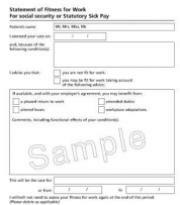 How to fill in a UK sick note: we explain that here; or if you want us to fill in your (UK) computer generated sick note, click here.